Plot: An aspiring author during the civil rights movement of the 1960's decides to write a book detailing the African-American maid's point of view on the white families for which they work, and the hardships they go through on a daily basis. 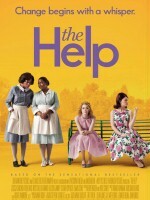 “The Help” is perhaps the most uplifting and moving film about civil rights since “Milk”. Unlike that movie, though, it doesn't show politics and big demonstrations – it shows a group of women who just by speaking the truth, with the addition of a lot of bravery and friendship, managed to make a difference. The protagonist is Skeeter, played by delightful Emma Stone – Skeeter is not like her friends – she doesn't care about finding husband and making babies. She wants to become a journalist. After seeing her whole life how badly black people are treated all around her, she decides to write a book showing the perspective of black maids working for rich, white people. The first maid who helps her find out the truth is Aibileen – she has been raising other people's babies for most of her life, forced to drop out of school to help her family. Those babies loved her and she loved them – they were neglected by their parents – fathers who spent all their days at work and mothers who were too busy hosting parties and gossiping with their friends. Skeeter was practically raised by black maid as well – she was like a mother to her, being for her whenever Skeeter needed her. Although these maids brought so much love and help into the households they were taking care of, they encountered humiliation every step of the way. The movie focuses on all the details that showed how horrible their situation was – white housewives made them go to the special bathroom, built outside, because as one of the characters puts it “black people have different diseases than we do”. Although slavery was seemingly abolished, they still treated them as if they owned them. The most despicable character in the movie is Hilly Holbrook, cruel, mean and devoid of any compassion. She doesn't see herself for the racist she is, warning Skeeter about “real racists” who live in in their town. “The Help” also shows kindness and true friendship that connected some of the housewives with their maids with the subplot about Celia Foote, eccentric housewife who, because of Hilly Holbrook and her gossip and rumor spreading, was a pariah in the neighborhood. Celia hires Minny, Hilly's former maid, who was fired for using the bathroom in the house. Celia doesn't care about what others do and what she is supposed to do according to the opinion of most people in her community. She insists on eating dinner with Minny and she welcomes her to her home as a friend and equal. Both women develop beautiful friendship, although they are so different in every way. Minny helps Celia with her personal tragedy, no one would even suspect just by looking at smiling and always joyful Celia and she reciprocates in showing Minny's support whenever her husband beats her up. As the movie progresses we see important events form the sixties in the background to the main story – Martin Luther King's effort for assuring civil rights and Kennedy's assassination. But the movie never loses its original focus – wonderfully written main characters – each vivid and superbly played by actors. It is extremely rare to find a movie with just an exquisite performance and “The Help” doesn't just have one – it has four. The best one is Viola Davis's role as Aibileen. Davis single handily stole the movie from both Meryl Streep and Philip Seymour Hoffman in “Doubt” - doing so with just one scene she was in - and now she creates yet another powerful portrayal of a strong woman who will do whatever it takes for her family and her loved ones. Another delightful performance comes from Octavia Spencer, who is a sure bet for Academy Award nomination as Minny – a true dynamite, a woman who never loses her spirit and wit. Jessica Chastain delivers her best work to date as Celia – both funny and heartbreaking, fierce and fragile. And Bryce Dallas Howard is simply amazing as the villain of the story – despicable Hilly Holbrook, the character you love to hate. The cast also includes Emma Stone as Skeeter – Stone is on her way to big stardom – I think she is a wonderful replacement for Meg Ryan as a main heroine in romantic comedies – she possesses same charm and likeable quality about her. Here she is truly wonderful – Stone is an actress who plays characters that are impossible to dislike. Because of her those girls are always adorable, they are the kind of women who you would like to have as your friend. We also get to see Sissy Spacek in hilarious turn as Hilly's mother and Allison Janney as Skeeter's mom determined to find husband for her daughter..
“The Help” has beautiful cinematography – it is bathed in warm, vivid colors, that take you back in time to the sixties, where housewives were tending their flowers on the yard, with coca cola in their hand, waving to their neighbors. The costumes are beautiful and the attention to detail is mesmerizing. The story structure is well thought - the movie is one of this rare gems that blend humor and tragedy perfectly – there are plenty of scenes that will make you laugh and a fair share of those that will bring tears to your eyes. 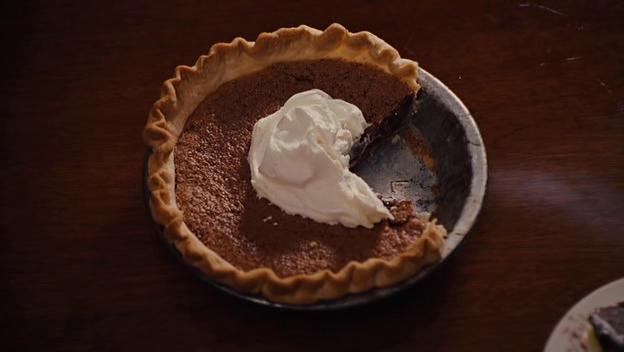 There is also a pie eating scene that will both shock you and make you laugh till you cry. During last few years there was a lot of f films like “Far from heaven”, “The hours” and “Revolutionary Road” which showed us what was behind the facade these women, mothers, wives, perfect housewives, were hiding under. In “The Help” we get to see that facade in all its glory – those housewives, always with impeccably groomed hair, colorful dresses and smile on their faces. But there are glimpses of reality – like shame and sadness on the face of the woman that Aibileen works for, or the heartbreaking expression on Skeeter's mother face when she is forced to fire her maid to avoid “embarrassment” in front of her friends. As of this moment “The Help” is the movie I've seen most frequently this year – three times. Each time the experience of watching it is fantastic – between beautiful story, unforgettable performances and lovely visual side there is a true, beating heart in this movie – the sense of solidarity that people are able to create when they are “trapped in Hell” as Minny puts it. The film is a classic storytelling at its best – in the flood of vulgar comedies, CGI loaded blockbusters and pretentious indie movies, “The Help” is truly refreshing. You don't need to reinvent the wheel – old recipe for making a good movie – great script, fantastic actors and talented director – will always be enough to make a truly wonderful film, everyone can enjoy. I really liked this movie, too. I read the book before I saw the movie, and I fell in love with it...it was such an inspirational tale. I actually cried over five times while watching the movie...and hey, that's no easy feat. The entire cast is just brilliant. It's so rare to have so many fine female performances and characters in one film. I really hope that Viola Davis gets an Oscar nomination, and I totally wouldn't mind if she won it, either. Jessica Chastain is another one who I'd love to get an Oscar nomination. She's had such a brilliant year with The Tree of Life, Take Shelter and The Debt, but her best work was here. Celia Foote was my favourite character in the book and Jessica did an amazing job playing her. The performances were rich and the events that happen feel real, it just went on way too long at some points which really had me checking my watch. Great review though! The Twilight Saga: Breaking Dawn, part 1. A Guide for Alan Rickman's movie partners. Black Swan - Possession theory, step by step.